March 2017 35 Above 'Tuscan' is the shade of the travertine tiles, which came in the sizes of 8"x8", 8"x16", 16"x16" and 16"x24", and were placed in a 'French,' or random pattern for the majority of the pool deck. The pool coping, the edge of the deck and the edge of the decorative inlay are Indiana Limestone pavers. To get the interesting pattern of the inlay, 24"x24" pieces of travertine with their corners cut off were installed at a 45-degree angle from the house. In this manner, small squares were left between each paver that were filled with pieces of limestone. Mid American Pools was the pool subcontractor. Above The deck's base consisted of 6" of aggregate followed by a 4"-thick concrete pad and then a 1"-deep sand setting bed. For proper drainage, the base slopes ¼" per foot away from the house, and away from the pool – both leading to the ACO 'Brick- slot' drains. Because of the pores in the travertine, clean, fine sand, which is easy to rinse out of the pores, was swept into the joints instead of polymeric sand. 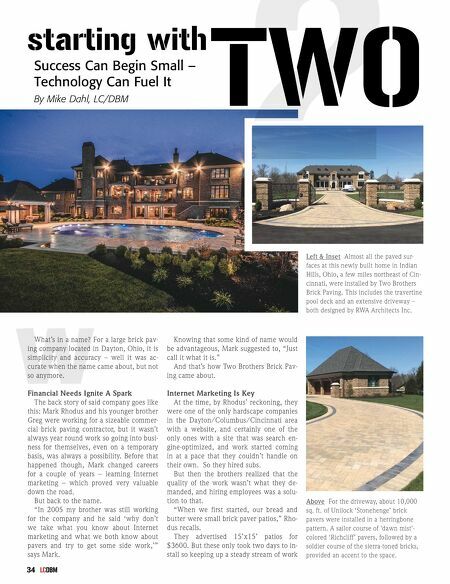 The Techniseal JS sealer applied to the pavers with a power sprayer protects the travertine from the harm that the runoff from the saltwater pool could cause. wasn't easy. Then the company landed a $15,000 project, the photos of which they put on their website, and started getting calls for comparable projects. Two Brothers did the same thing after completing a $50,000 job, with similar re - sults. Ultimately they removed the "bread and butter" pho- tos and gratefully stopped getting calls for them. The Results Now, according to Rhodus, the company consists of around 16 total employees including three crews of four people each, typical residential installations are $150,000 and up, and commercial work accounts for 70 percent of the jobs. A recent large-scale job was at a newly built house in Indian Hills, which is a few miles northeast of Cincin - nati. 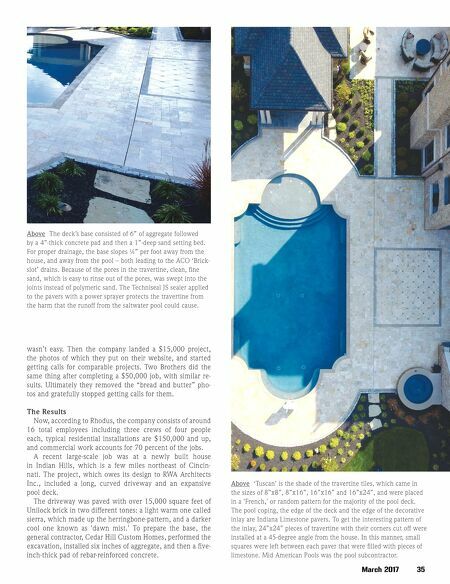 The project, which owes its design to RWA Architects Inc., included a long, curved driveway and an expansive pool deck. The driveway was paved with over 15,000 square feet of Unilock brick in two different tones: a light warm one called sierra, which made up the herringbone-pattern, and a darker cool one known as 'dawn mist.' To prepare the base, the general contractor, Cedar Hill Custom Homes, performed the excavation, installed six inches of aggregate, and then a five- inch-thick pad of rebar-reinforced concrete.